12-YR-OLD GIRL EXPOSES FATHER: ‘He serially raped me, aborted my 4-month-old pregnancy - BlogIT with OLIVIA!!! THE people of Immringi community in Ogbia Local Government Area of Bayelsa State are in shock following the allegation of incestuous relationship between a middle aged man, Bamekpa, and his 12 year old daughter (names withheld). 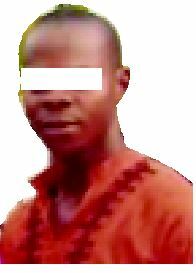 Bamekpa allegedly started having canal knowledge of the girl at the age of 11. The girl allegedly took in, before the father reportedly aborted the four-month-old pregnancy that is now threatening her life.Relatives accused Bamekpe of a history of incestuous behaviour as he was alleged to have slept with his biological sisters, while also having carnal knowledge of his cousin’s daughter who he allegedly forced to commit abortion five times. In the case of his daughter, the lid blew open when the victim ran away from home to seek help from her uncle, one David Apigi, following her deteriorating health condition as a result of complications from the abortion. Sunday Vanguard gathered that it was the girl’s stepmother that discovered she was pregnant and informed the father who then handed her over to a lady who took her to a doctor for an abortion.Then the girl returned home to discover she was bleeding from her private part, and ‘again’ the father took her to the same doctor who then took her to other places. In her statement to Operation Rescue, OPER, a human rights group, the embattled girl said she ran away from home since there was nobody to help her as she could no longer bear her father’s abominable acts. She narrated: “There was nobody to help me. He (father) kept doing it despite my efforts to stop him. It was a painful and violent experience. I ran away from home because there was a time I bled so much from my private part.“When I became pregnant and he heard about it, he handed me over to a lady doctor who took me through an unsuccessful process of abortion. I have been suffering series of health issues since after the abortion. ”Her uncle, who claimed to have reported the matter to the Kolo Police Station in the area, disclosed that, through the help of his cousin, one Rex Ogboku, in Abuja, the matter was reported to the Federation of Women Lawyers, FIDA. However, he said he decided to contact the Operation Rescue, OPER, as FIDA was slow in handling the matter but regretted the manner the police were also going about with the case following the arrest of the suspect, adding that the suspect had been begging him for a soft landing while in police detention. The head of OPER, Mrs Elizabeth Egbe, who also lamented the condition of the girl- disclosed that investigation showed that she had been perpetually raped impregnated and had an abortion that had left her with health problems as the abortion was performed by a quack doctor. She urged the police to thoroughly investigate the matter and get to the root of the case, stressing that all those involved should be arrested and prosecuted to serve as deterrent to others. The OPER head called on the society to protect the girl-child. The spokesperson for the Bayelsa State Police Command, Asinim Butswatt, could not be reached to confirm the incident.